Thanksgiving morning is always a flurry of getting the turkey in the oven and preparing dishes for the big meal. Breakfast is usually an afterthought and ends up being toast or a bowl of cereal. 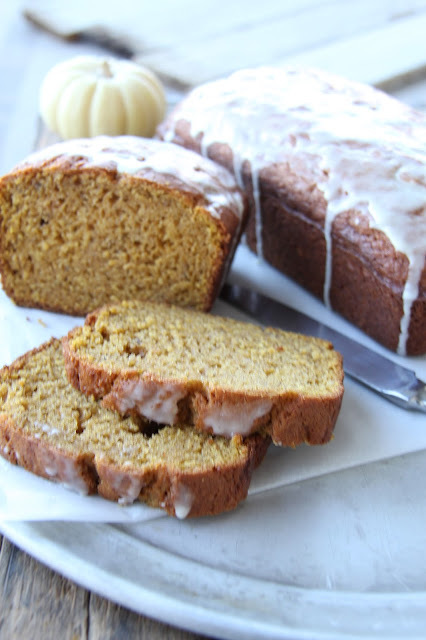 This year, I'm making Pumpkin Banana Bread with Orange Glaze the day before, so we can cut a few slices to enjoy with eggs and fruit. I hope you and your family enjoy a day filled with good food and great memories. Place the rack in the center of the oven, and generously grease and line the bottom of two loaf pans with parchment or wax paper. Preheat oven to 350 degrees. Place eggs in a mixing bowl. Beat for about 1 minute. Add sugar beat again for 1 minute. Add the oil, pumpkin, bananas and vanilla. Beat until all ingredients are incorporated. Place the flour, baking soda, baking powder, salt, and cinnamon into the bowl with the pumpkin mixture. Mix just until the wet and dry ingredients are incorporated. Pour the mixture into the prepared loaf pans. Bake for 50-60 minutes or until knife inserted in center of loaf comes out with a few moist crumbs attached. Remove from oven. Let sit for 5 minutes in pan. Loosen sides of loaf if necessary with butter knife. Remove and cool completely on wire rack. Mix glaze with whisk. Place wire rack over a cookie sheet. Pour the glaze over the loaves and let any excess glaze drip onto the cookie sheet. -I make a liner for the loaf pan by placing parchment or wax paper under the pan and tracing around the bottom of the pan. Cut the paper on the line. Place the paper in the bottom of the loaf pan and spray sides of pan and bottom (on top of the paper liner) generously with cooking spray. -I bake in 4 1/2 x 8 1/2 pans. When I place the batter in the pans, they fill the pans over 3/4 full. There is about a 1/2 - 3/4 inch space to the top of the loaf pan. This recipe will easily yield 3 smaller loaves. Adjust the baking time to 45 minutes then check to make sure loaf is set. Winner of the Williams Sonoma Thanksgiving Giveaway! Congratulations to Jamie Neider (@jamieneider), you are our Williams Sonoma gift card giveaway winner!! You have 24 hours to claim this prize by emailing me your mailing address. My mother in law taught me how to make rolls when I was first married over 33 years ago. This recipe has been in my husbands family for years and is one of our kids' favorite! It is one of my favorite recipes because it calls for dried milk, which I store for emergencies. Doreen's Rolls have become legendary among our family and friends. If you've never made homemade rolls, I highly suggest this recipe, the dough is very soft and pliable and so easy to handle! They are the perfect shape for stuffing a bit of turkey and cranberry sauce inside for the best after Thanksgiving snack. -I like to warm the bowl I am using to make rolls by running warm water over the outside of the bowl in the sink for a few seconds. Make sure to dry the bowl before using. -The perfect temperature for water used with yeast is the same temperature you would use to bathe a baby! Not too warm, not too cold. If you remember this, you will not go wrong. -Do not set the bowl you are using to make rolls on the counter top if it is stone of any type (including granite, quartz, marble). The stone naturally stays cold and will keep the rolls from rising properly. -Heat a cup of water in the microwave for a minute. Remove cup. Then place a bowl of dough into the microwave to raise. The warmed water will have created a nice warm area for your dough to rise. -You may place all of the rolls on one jelly roll size pan to bake, or you may space them farther apart on two cookie sheets or jelly roll pans. -For make ahead, make the rolls to the shaping step. After the rolls are shaped and placed on the cookie sheets, cover with plastic wrap and place in freezer immediately. On the day of baking, remove the pans from the freezer about 4 hours before serving. 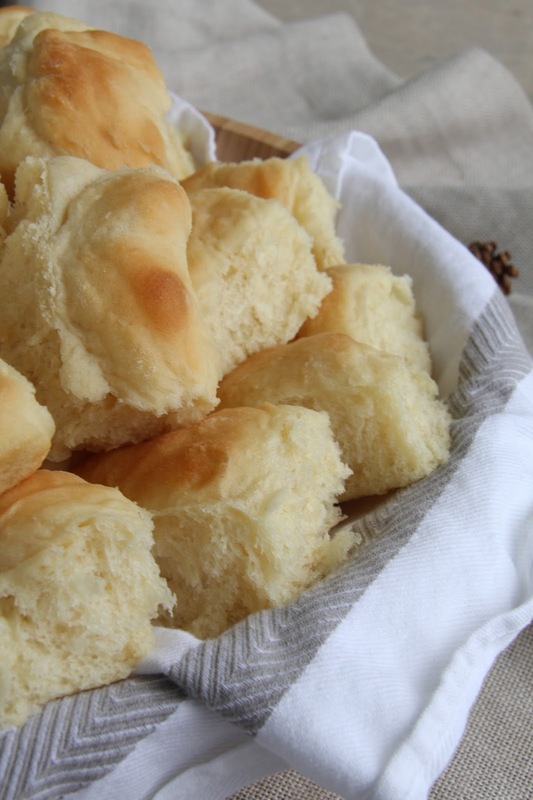 Let the rolls thaw and raise in a warm kitchen, covered with a light kitchen towel. When rolls are almost double in size, place in hot oven and cook.